Winter can be dreary. 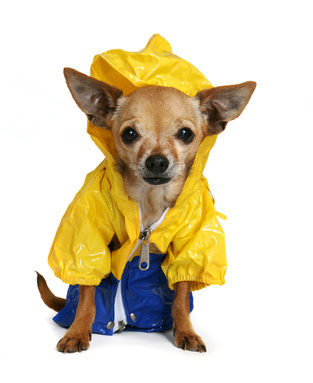 Chihuahuas, like people, can be affected by the shorter days and cold nights. Mostly we’re affected by how you feel. If you’re blue, we will sense that. Whether or not Chihuahuas are affected by the winter blues, we are certainly not fond of cold weather. Chihuahuas are known to love the heat. I for one can never be too warm. I am never far from a comfy blankie. I also hate the rain. It’s very wet. Who wants to walk in wet grass and sloshy puddles. Boots are out of the question. I don’t like my feet touched. Did you know we use our feet as a sense of smell and to spread our scent? Snow… forget about it. It’s rare to find a Chi that likes playing in the snow. Move to a warm climate. I live in Southern California where it is mostly warm. Although living by the beach can be a bit chilly. Have central heat. Keep it warm inside. Indoor plumbing for you Chihuahua. Why go outside in the cold and snow when there exists perfectly good piddle pads for easy indoor access. Sunlamps and ocean sounds. Just kidding. Sorta. A warm, inviting lap. Cover your Chihuahua with a cozy blanket when they’re all settled on you. Lots of fun playing with toys and throwing balls. Exercise is always important for you and your Chi. All that movement keeps your Chihuahua warm. Play some more. With all that attention we don’t have time to feel blue. Food. I love to eat. Most Chihuahuas do. Feed us lots of small treats. You don’t want us to get too fat. Clean water. Wash our water dish daily. Who wants to drink out of a slimy bowl of stagnant water. That would make anyone blue. Give us lots of love and attention. We’re easy to please.